Start Reading the Bad Boys of Sweetwater for FREE! Nearly twenty years ago, I came up with the idea for a series about 12 brothers. Crazy, I know. Plus, it took me forever to finish it. It all started with my idea of having a single father with six young boys who has been accused of murdering his second wife. 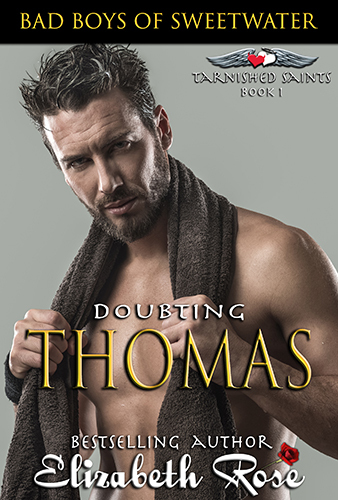 From now through April 10th, you can read this book, Doubting Thomas, Book 1, of my Bad Boys of Sweetwater: Tarnished Saints Series for FREE! This is a little different from the rest of the books in the series because it focusses around a murder and a man who was too drunk to remember if he actually did it. Thomas deals with a lot of introspection in this book. He prays for an angel, but instead gets Angel DeMitri, an agent from Child Protective Services showing up on his doorstep. Will Thomas be able to prove his innocence, as well as that he’s a good father, or will Angel be the one to take his children away? Read Doubting Thomas for FREE. US link, UK link, CA link, AU link, IN link. This series is near and dear to my heart because it was inspired by things, people and places in my life. I grew up visiting my grandparents on the lake in Michigan, so some of the places in the series as well as some of the instances are real. Here is a quick look at all of the brothers and their books. To find out more or to read excerpts from any of the books in the series, please stop by my website. 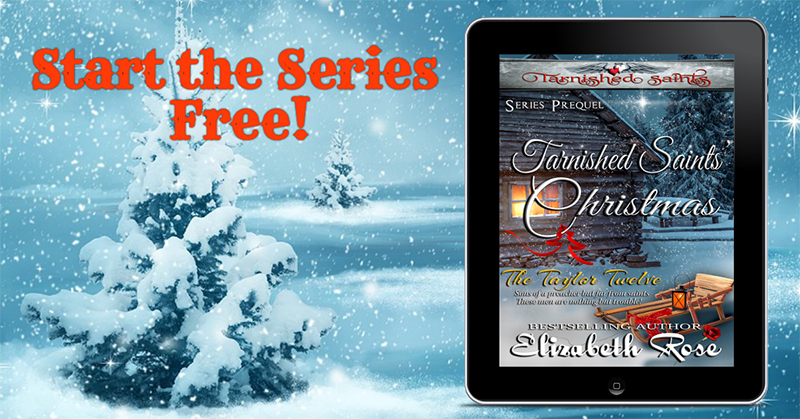 Kindle Unlimited members read the entire series for free. One last bit of business. 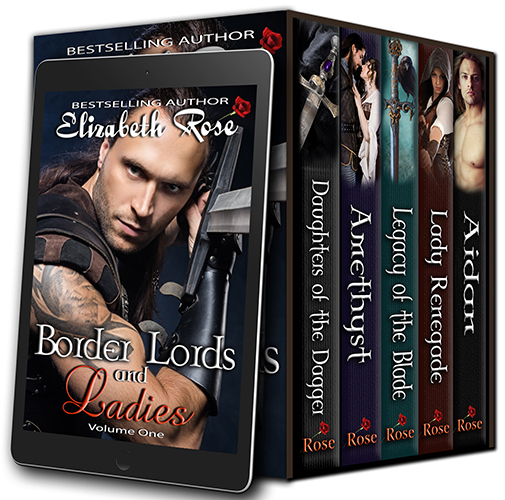 From now through April 12th, I am offering the crazy deal of picking up the Border Lords and Ladies boxed set, Volume 1 on kindle countdown (US & UK) for only 99 cents! This set normally sells for $9.99 and contains books from four of my series. 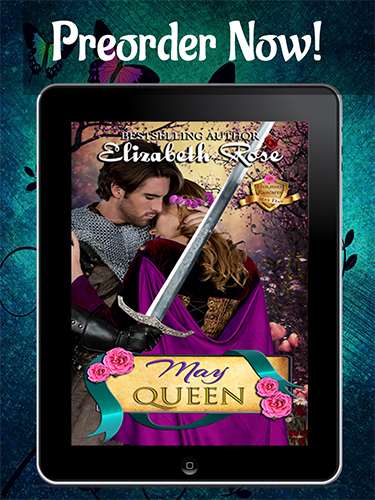 And please, don’t forget I have another of my Holiday Knights books, May Queen: Book 3 release on May Day, May 1st. You can preorder it now for only $2.99 and it’ll be delivered right to your e-reader on May Day. US link, UK link, CA link, AU link, IN link. Thanks, and enjoy the books. Be sure to leave reviews on Amazon, Bookbub and Goodreads when you’re done, if you have the time. This entry was posted in audiobooks, Boxed sets, Contemporary Romance, Medieval Romance, New release, Paranormal Romance, Pre-order, Uncategorized by Lizrosek. Bookmark the permalink.